If Egypt is on your bucket list, then you already know what you want Things To Do In Egypt. But the point is not to miss a single thing. 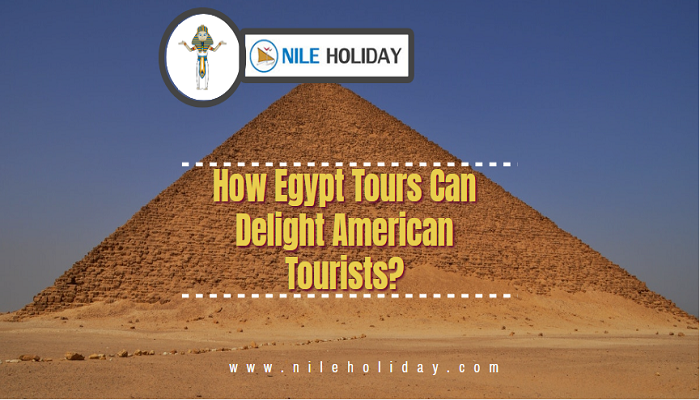 Which is why, we made a list of exciting things that you can do on your Egypt Tours. So, fasten your belts, and buckle up…..
• Get lost in the magic of Great Egypt’s infamous Pyramids at Giza. • Enjoy the tranquillity and beauty of Egypt’s pulse Nile River. • Or get deep with River Nile cruising days long. • Shoppe in the markets and souks for Egypt’s antique, souvenirs and delights. • Explore museums, temples, Palaces, Mosques, Churches and many unseen Egypt mysteries. • Discover Arabian nights in desert oases. • Know different red sea beaches and their individuality. • Go for water sports like diving, snorkelling, deep sea fishing etc. • Or enjoying beaches like sunbathing, swimming, kite surfing etc. • Unlock the treasures of Sinai like mountains, citadels, canyon, underwater fun etc. • Filling your heart with mouth-watering Egyptians delicacies. • Have dinner with ethnic and Bedouin tribes in Egypt such as the Nubian tribe in Aswan. • Live in the unadulterated air and enjoy the traditional lifestyle, cuisines, crafts etc. • Dance with the Egyptian tribes at campfires when discovering the unadulterated oasis. • Get camel rides, quad biking etc. to explore the Egyptian Deserts and Egyptian Pyramids. But be careful, have a guide with you who will save you from getting mugged. • Taking photo of kissing Sphinx nose during pyramid visits. • Haggle for some traditional or contemporary heads gears or men’s wear that will help to mingle and adapt to their culture and climate. • Take felucca rides during evenings for spectacular sunsets and serenity of Nile River. • Take Felucca rides to Abu Simbel etc. and unlock your senses to the magnificent town and temples whole day for some cosy and personal Nile moments. • Horse carriage ride for sightseeing through the city. • Hot air balloon rides to explore sands, river and civilisations. • Quad bike rides in Egyptian Oasis. • Uncover the underwater fun in red sea beaches like Hurghada, etc. • Witness the infamous coral reefs in Sinai beaches. Egypt will never stop surprising you. And with the current state of peace, it has started worming its way to the hearts of travellers worldwide. 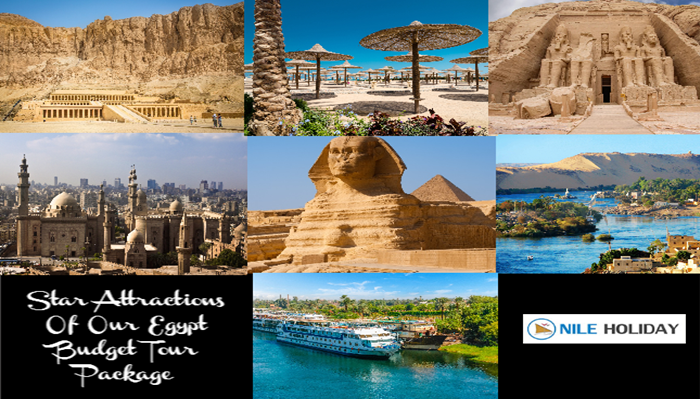 So, let your Egypt fantasies run wild again and explore your dream vacation with NILE HOLIDAY. "A massive list of the top tourist attraction and things to do in Egypt. What to see, where to stay and when to visit." 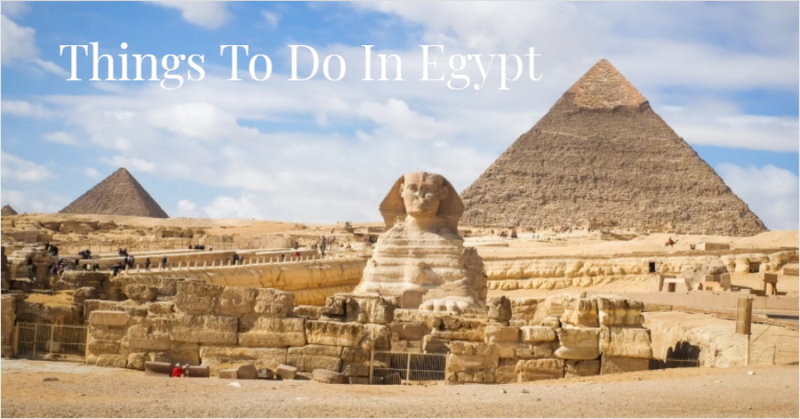 Then Click @ More Things To Do In Egypt, today!